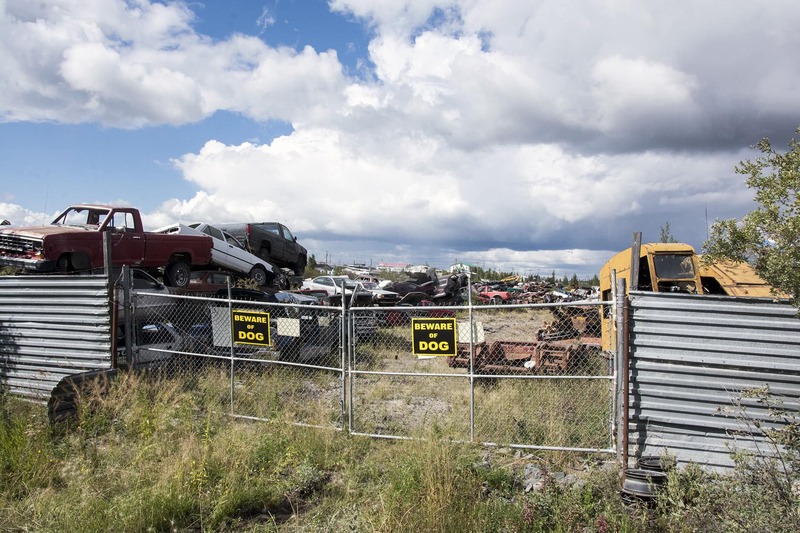 For decades now, Yellowknife’s been creeping steadily away from its blue-collar roots. As mining camps closed, the suburbs blossomed. Old Town, once the city’s bustling centre of industry, is home to far more bureaucrats these days than miners, truckers and surveyors. On the southern edge of the city, however, there’s one neighbourhood that still resembles something like a working-class frontier town. Kam Lake — a patchwork of junkyards, quonset huts, gravel pits and semi-trucks — is still quite unlike anywhere else. If you like big lots, industrial aesthetics, and plenty of space to make noise (here’s looking at you, sled-dog owners), this neighbourhood’s for you. Lying in a shallow valley that runs inland from the west side of the lake that gives the neighbourhood its name, the area was zoned for commercial and industrial use in the 1970s. From the beginning, people were allowed to live on the oversized lots in ‘caretaker suits,’ and since then, the zoning has been tweaked to allow more residential development. Nonetheless, the area remains thoroughly industrial: it’s scattered but functional, with unexpected quirks everywhere you look. There are homes with well-groomed lawns and trampolines next to yipping dog kennels; junk yards within a stone’s throw of businesses selling new snowmobiles and motorcycles; there’s even a smattering of farm animals, with horses and goats unexpectedly popping up in pens around the neighbourhood. Kam Lake is steadily becoming more amenable to residential development, and the new Grace Lake North subdivision has introduced a number of million-dollar mansions — some of Yellowknife’s largest — to the area. This trend will continue with the development of the Grace Lake South subdivision. Yet, for all the handwringing from residents worried about encroaching gentrification and domestication, Kam Lake’s still a bit too wild to become a dull residential area any time soon. The ice on Kam Lake melts slightly earlier in the year than the ice on Yellowknife Bay. This was noted in 1936 by mining company Cominco, which built a short-lived prospecting camp on Kam Lake’s eastern shore where their float planes could land. The next incursion into the area happened in the 1940s, when a road was cut south from boomtown Yellowknife to build a radio tower in the wilderness between Kam and Grace Lakes. The tower is still standing today, and the road is now known as Kam Lake Road, the neighbourhood’s main artery. Kam Lake is about as far from downtown as you can get while still being within city limits. Which isn’t actually that far, truth be told. But it’s far enough that you need a car to get pretty much anywhere. Though, again, this probably isn’t a problem — if you’re living in Kam Lake, chances are you’re keen on vehicles. There are currently two ways in and out of Kam Lake: up the Kam Lake Rd. hill, past the jail and the Fieldhouse to Old Airport Rd., or else out around Deh Cho Bvld, past the airport. Other than Starvin’ Marvin Bistro, a petite green food truck that lives on the corner of Taltheilei and Enterprise Drives dishing up healthy dollops of goulash through the summer, there’s not much in the way of restaurants, corner stores or other amenities in Kam Lake. That said, if you’re living in a Kam Lake work camp or caretaker suite, you’re not all that far from the Old Airport Rd., with its restaurants, bars and grocery stores. From a recreational standpoint, Kam Lake comes alive in the winter, as dog teams and snowmobiles take to the kilometres of trails and frozen lakes south of the neighbourhood. There are several other pockets around Yellowknife where people keep dog teams, but chances are, if you’re a musher, you live in Kam Lake. For those who want to try the sport, but don’t have their own teams, there’s Beck’s Kennels. The trails south of Kam Lake aren’t quite as accessible in the summer, but there are still a number of hiking areas. And with development of the Grace Lake subdivisions, the City is opening a new mini-park and some walking trails around the lake. If you like dirt-biking or zipping around in dune buggies, the Sand Pits are a clear shot out the Deh Cho Bvld. And both the Multiplex and the Fieldhouse are just up the hill. No luck on the school front. Though the neighbourhood isn’t too far from two schools just up the hill in the Frame Lake suburb: K-5 public N.J. Macpherson School and K-8 Catholic École St Joseph School. Both the Catholic and public high school are downtown.